Dr. Martin Luther King Jr. was by far one of the greatest leaders and most influential men in our country’s modern history. Only three men have a national holiday named after them: Christopher Columbus, George Washington, and Dr. Martin Luther King Jr.
A minister and activist, MLK Jr. lead the country through some of its most turbulent times at the forefront of the civil rights movement. While he certainly was marching and protesting for the equal rights of African Americans, MLK Jr.’s vision was much broader and inclusive, believing that ALL people deserved to be treated with equality and justice. 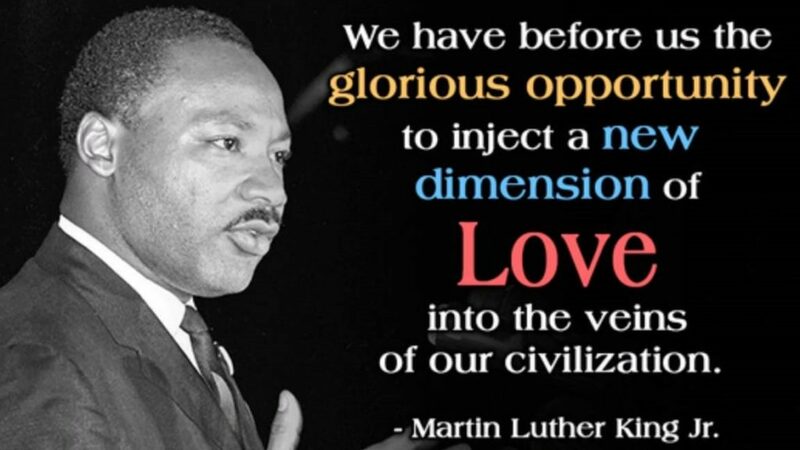 Even though the civil rights movement took place in the 1950s and 1960s before Dr. King’s assassination in 1968, his ideals, vision, hard work, and wise words continue to echo through the fabric of our society decades later. 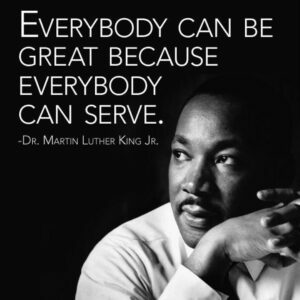 He believed not only in equality for all, but also in being of service to others. Martin Luther King Jr. Day is recognized as a federal holiday the third Monday every January, around the time of his birthday on the 15th. It is a holiday to honor the memory of a great and compassionate leader. And, it is also a great day to honor what he stood – and died – for. At Making A Difference Foundation, we work everyday to be of service to others for the greater good of our community and neighbors. Whether with food, housing, a kind word, or a simple smile, we believe as Dr. King did, that we can all help others no matter how small the action. We challenge everyone within our community to honor this holiday by upholding MLK Jr.’s ideals and dreams through a call to action and day of service. Engage with your community and service organizations like ours to help bring awareness to issues affecting our hometowns and communities across the world. Volunteer your time at a local food bank, homeless shelter, youth club, or similar agency. Don’t just help, but interact with the clients to learn more about their plight and struggles. Engaging with people who may walk a different life path can offer greater understanding and inspire new ways of overcoming the struggles they and the community face. Donate what you can. No donations are too small as they all compound when many people give. Whether it is money or simply items of food you have around the house, maybe blankets you don’t use; it all matters to someone who is without these things. Write letters to your public officials to help advocate for necessary change to our systems that affect equality and prosperity for all. Get the word out about important issues through public speaking or by offering free workshops using information you may have that can help others. Use your skills to help others. Are you really good at budgeting? Offer to help and teach those who struggle with this skill so they may learn to achieve better financial stability. Are you great at cooking? Offer to teach people on a budget how to cook healthier meals for themselves and their families. Teach someone how to grow their own food if you love gardening. You may overlook the skills you have, but to someone else what you know has great value! Mentor a child. Whether through reading and encouraging them to continue reading, helping them with homework, to teaching them a valuable skill that will help them in life, children need adult mentors to help guide them to a better tomorrow. Go for a walk and pick up trash as you go. You’re not only serving yourself with great exercise but also improving the community. Visit a senior center or retirement home and talk with the residents. Not everyone in their golden years has family to visit. Spend time with them to remind them they are important. You also might just learn something valuable in return!